This has tendril-like pedicels, which curl around nearby plants, but the stem is stout and erect, over two feet tall, smooth below and hairy above, with smooth, dark green leaves, and bears a long, crowded, one-sided cluster of pink buds and pretty white flowers. They are each about half an inch long, with hairy calyxes, and the corollas are prettily tinged with lilac or pink, but are too pale in color, though the general effect of the plant is rather striking. The anthers are bright yellow. This grows in the South. A. virga is a smooth plant, from two and a half to five feet tall, with many wand-like stems, springing from a perennial base, and reddish-purple flowers, about half an inch long, forming a long, rather one-sided cluster. This grows in the chaparral, on ridges of the Coast Ranges, blooming in June, but is not common. White Snap-dragon -A.Coulterianum. FIGWORT FAMILY. 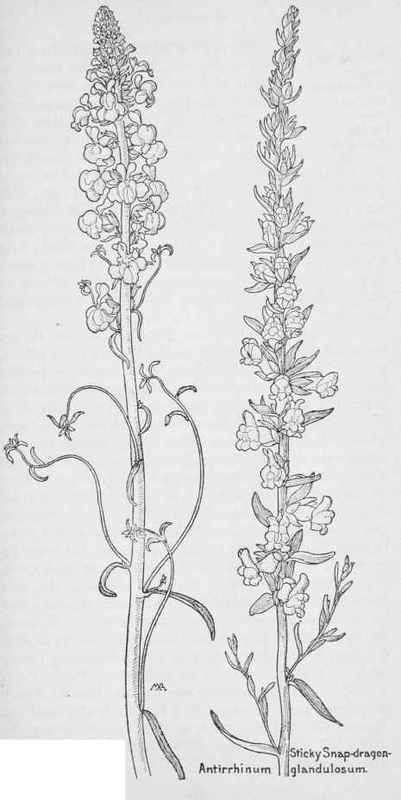 Scrophulariaceae.